Palo Alto, a city known for high-tech, higher eduation and high-end homes, has a very low-end problem. In fact, it's a downright smelly, dirty, ugly problem that has residents complaining and city workers scrambling to clean up. The mess at an underpass on Embarcadero Road at Alma Street has become so bad, crews will have to shut down traffic at night to clean it out. 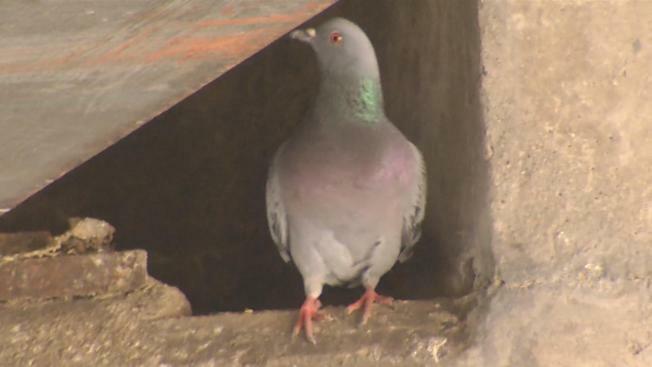 The area has become a virtual hotel for hundreds of pigeons who have left behind a pickup truck worth of droppings. "It's not just how it looks, it's the odor," neighbor Pauline Thomas said. "It is so bad. And we walk through every day. During the ballgames when it rains, the odor is unbelievable. It's just not a healthy environment." Thomas and other neighbors filed a complaint with the city. They're thrilled to learn that, starting Tuesday night, the city will spend the next seven nights washing out the underpass and installing netting to prevent the birds from roosting in the rafters. The affected section of Embarcadero Road will be shut down from 10 p.m. to 6 a.m. through Thursday this week and then the same overnight hours Monday through Thursday next week. "It just makes sense because this is a health concern," neighbor Nancy Freeman said. "I think cleanliness is really important because of the risk of disease. I think it's a great idea."